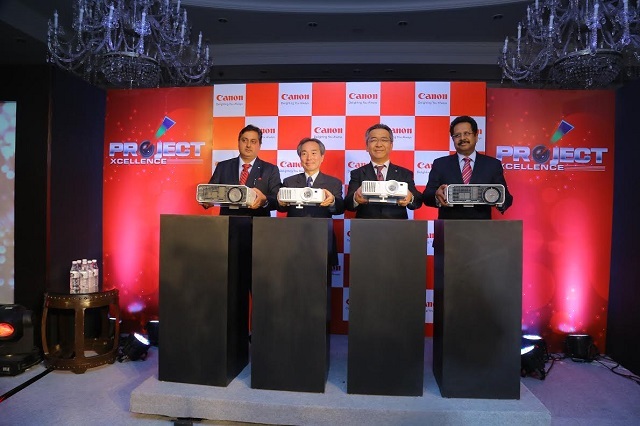 Canon, the digital imaging company have flooded the Indian projector market with nine new LV and XEED series projectors featuring an advanced new technology for better projection of colors and reduce operational costs. Canon has introduced its proprietary LCOS (Liquid Crystal on Silicon) technology to its XEED series of projectors which removes faint grid over the projected images that appear on traditional projections. The XEED series of projectors also support USB projection which expands its use case making it truly a next gen product. On the other hand, LV series is focussed on bringing down the operational costs. It features longer lamp life and air filter-free design making great use of DLP BrilliantColor display technology to deliver rich colors with 3000 lumens of brightness, a 2300:1 contrast ratio for pure black with depth and dimension and filter-free operation. The Eco mode which is the economical mode lowers the cost of operation reducing power consumption by 20 percent also lowering the fan noise. The new series of projectors launched are LV-WX300, LV-X300, LV-S300, LV-WX300ST and LV-X300ST and the XEED WUX450 and the XEED WX520, XEED WUX400ST and the XEED WX450ST. These projectors are ranging from MRP 40,750INR to MRP 5,00,000INR.